For other uses, see Groot (surname) and de Groot. For the mountain, see Hohgrat. Groot (/ɡruːt/) is a fictional superhero appearing in American comic books published by Marvel Comics. Created by Stan Lee, Larry Lieber and Jack Kirby, the character first appeared in Tales to Astonish #13 (November 1960). An extraterrestrial, sentient tree-like creature, the original Groot first appeared as an invader that intended to capture humans for experimentation. Grut (left) with Rocket Raccoon. The character was reintroduced as a heroic, noble being in 2006, and appeared in the crossover comic book storyline "Annihilation: Conquest". Groot went on to star in its spin-off series, Guardians of the Galaxy, joining the team of the same name. Groot has been featured in a variety of associated Marvel merchandise, including animated television series, toys and trading cards. Vin Diesel voices Groot in the 2014 film Guardians of the Galaxy, its 2017 sequel, Guardians of the Galaxy Vol. 2 and reprised the role in the 2018 film Avengers: Infinity War and will do so again in Avengers: Endgame (2019) while Krystian Godlewski played the character via performance capture in the first film. Since his film premiere and animated series debut, Groot has become a pop culture icon, with his repeated line "I am Groot" becoming an Internet meme. 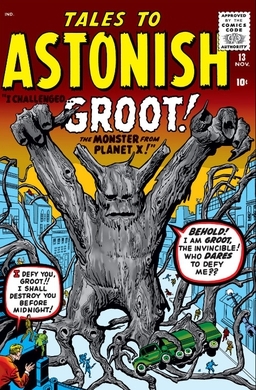 Groot first appeared in Tales to Astonish #13 (November 1960), and was created by Stan Lee, Larry Lieber and Jack Kirby. "Groot" is the Dutch word for "large", possibly referring to his stature and ability to grow in size. He appeared again in The Incredible Hulk Annual #5 (Oct. 1976), alongside five other monsters from Marvel's anthology horror comics of the late 1950s and early 1960s. In The Sensational Spider-Man #−1 (July 1997), Groot was featured in a nightmare of the young Peter Parker. Groot reappeared in 2006 in the six-issue limited series Nick Fury's Howling Commandos, and appeared in the Annihilation: Conquest and Annihilation: Conquest – Star-Lord limited series. Groot went on to join the Guardians of the Galaxy in the series of the same name, and remained a fixture of the title until its cancellation with issue #25 in 2010. Groot appeared in its follow-up, the limited series The Thanos Imperative, and, alongside fellow Guardian Rocket Raccoon, Groot starred in backup features in Annihilators #1–4 (March–June 2011) and Annihilators: Earthfall #1–4 (September–December 2011). Groot appeared in issues #6–8 of Avengers Assemble as a member of the Guardians. Groot is one of the stars of Guardians of the Galaxy vol. 3, a part of the Marvel NOW! relaunch. The Groot that debuted in Tales to Astonish and the one that was introduced in Annihilation: Conquest were retroactively established as being separate members of the same species in the sixth and final issue of the Groot ongoing series that launched in June 2015. With Infinity Wars in August 2018, however, Groot specifically references the fact that during his first visit to the planet Earth, he had promised to "march across the surface of the planet and doom all who dared to oppose Groot." This seemingly reverted the character's origins to having both eras of Groot referencing the same persona, therefore invalidating the retroactive change from issue six of the Groot series. The Flora colossus sapling that would come to be known as "Groot" came from an "Ennobled Sap-line" and gifted with a tremendous grasp of quasi-dimensional super-positional engineering. Groot did not get along with fellow saplings but instead preferred the company of the "Maintenance Mammals", which the other saplings treated with prejudice. Groot was exiled by the "Arbor Masters" in GUARDIANS OF THE GALAXY #14 after killing another sapling to defend a maintenance mammal it was brutalizing. An alternate origin was presented in the Groot ongoing series. In the story, it is revealed that the other Flora colossi had been abducting organisms from other planets, including a young human girl named Hannah. After seeing Hannah, Groot realized what his people were doing was wrong and managed to save the child and send her back to Earth. However, for his disobedience, Groot was exiled from Planet X and forced to wander the universe until he met Rocket Raccoon many decades later where this version of Groot later became a member of the Guardians of the Galaxy. Yet another alternate origin was presented in "Guardians of Infinity", written by Edgardo Miranda Rodriguez, wherein a woman makes the claim that Groot is a ceiba tree from Ponce, Puerto Rico. According to Puerto Rican folklore, a ceiba tree is believed to possess the spirits of the indigenous Taino population that formerly thrived on the Caribbean island. By her logic, the woman considers Groot to be Puerto Rican. Groot is an extraterrestrial tree monster who initially came to Earth seeking humans to capture and study. Groot was seemingly destroyed by termites used by Leslie Evans. Xemnu made a duplicate of Groot by making a human and tree hybrid that was used to fight the Hulk, but it was destroyed in the battle. Groot was later revealed to have survived, but was a captive of the Collector and held in his zoo in Canada until Groot and the other captive creatures were freed by the Mole Man. Groot and the other creatures rampaged in New York City until they were stopped by a band of superheroes, and were then dumped through a portal to the Negative Zone. Groot was later tracked down and captured by S.H.I.E.L.D. 's Paranormal Containment Unit, nicknamed the Howling Commandos when his tree scent was detected by Sasquatch and Abominable Snowman. While Groot was being held captive, Gorilla-Man talked to Groot about joining the Howling Commandos. When Merlin and his forces attacked the base, the Howling Commandos let Groot and their other captives free and they stampeded on Merlin's army; Groot was the only one to turn back and offered to join the Howling Commandos. Groot aided the Howling Commandos as they assaulted Merlin's forces. As a consequence of the battle, Groot dies, buying the team some time to escape. A new Groot was created as a sprig offshoot and went on to accompany the team on their continued mission against the Phalanx, but was one of the team members captured by the Phalanx. Groot and the others were freed by Mantis, and escaped back to the lines of the Kree's resistance. In time, Groot's body regenerated from the twig, growing back to full size. Groot and the others intended to carry on as part of Star-Lord's team. Groot and the team returned to Hala to prepare another assault against the Phalanx, but their agent Blastaar was captured by the Phalanx and taken to their Babel Spire as he tried to carry Groot's pollen spores. Groot and Rocket Raccoon continued their mission by sneaking into the sub-basement of the Babel Spire. When Star-Lord was captured by Ultron, the original plan of laying explosives in the Spire failed, so Rocket Raccoon and Groot needed to come up with a new plan. Groot decided to sprout inside the Spire, growing to colossal size and filling a large portion of the building. During the "Civil War II" storyline, Groot and the Guardians of the Galaxy are summoned by Captain Marvel to help her in her fight against Iron Man's side when it came to the fate of the Inhuman Ulysses Cain. The resulting battle damaged the Guardians of the Galaxy's ship stranding them on Earth. During the "Monsters Unleashed" storyline, the Guardians of the Galaxy defend Groot from a snake-headed Leviathon. During the "Secret Empire" storyline, Groot and the rest of the Guardians of the Galaxy assist Captain Marvel, the Alpha Flight Space Program, members of the Ultimates, Hyperion, and Quasar in intercepting a fleet of Chitauri that are approaching Earth until a Hydra-aligned Steve Rogers activated the Planetary Defense Shield trapping those fighting the Chitauri outside of Earth's atmosphere. Star-Lord, Rocket Raccoon, and Groot try to enlist representatives of the Skrulls, Kree, Brood, Shi'ar and Spartax empires that are on the Galactic Council in helping against the Chitauri hordes and to break down the Planetary Defense Shield and get rid of Hydra. Realizing they are now facing a galaxy without human interference, the Galactic Council refuses aid and attempt to kill the three Guardians as they flee. After the Planetary Defense Shield is shut down, Groot and the Guardians of the Galaxy join the final battle against Hydra. Rocket Raccoon and Groot are on their way to the Stohlad Ring when they are ambushed by Gardener where he shattered Groot because the Guardians of the Galaxy "corrupted" him and diverted him from his true purpose. Rocket Raccoon escaped with a splinter where Groot grew a new body from it. During the "Infinity Countdown" storyline, Groot was with the Guardians of the Galaxy when they notice that the planet Telferina is under attack by the Flora Colossi that Gardener grew from Groot's splinters. Groot got close to Gardener and used his healing powers to purge the poison that Loki put in him from his body. Gardener repaid Groot by using his abilities to restore Groot back to his previous size. In addition, Groot can now speak in full sentences and refers to himself in the third person. Black Bolt's brother Maximus the Mad asserted that whenever Groot is saying the trademark "I am Groot!" he has actually been saying a number of things, and his varying inflections of the sentence are the equivalent of words and sentences. People who have interacted with Groot are gradually able to decipher the meaning of the inflections and can carry on full conversations with Groot as time goes on. The mature form of Groot's species is robust and heavyweight, which causes the organs of acoustic generation to become stiff and inflexible. It is this hardened nature of Groot's larynx that causes people, who are oblivious to the subtle nuances of Flora Colossi speech, to misinterpret Groot as merely repeating his name. It could not be determined whether Maximus's claim was true or merely another manifestation of his madness, though Groot did genuinely seem to be assisting Maximus with highly advanced engineering. Later, in All New X-Men #23, Jean Grey telepathically links with Groot, showing that Groot's thought processes are indeed complex, and the declaration of "I am Groot!" usually represents attempts at highly intelligent communication. In the Marvel Cinematic Universe, Thor jokes that the Flora colossi language is offered as an elective in Asgardian schools in Avengers: Infinity War as his explanation for being able to understand Groot. Groot appears in The Avengers: Earth's Mightiest Heroes, voiced by Troy Baker. He (along with the other Guardians of the Galaxy) appear in the episode "Michael Korvac". Groot appears in the Ultimate Spider-Man cartoon series, initially voiced by Michael Clarke Duncan (in "Guardians of the Galaxy"), and later by Kevin Michael Richardson (for subsequent episodes). He first appears in the episode "Guardians of the Galaxy" in his stick form before later growing to his full size to defeat Korvac and some of the Chitauri soldiers. At the end of the episode, two irises briefly open up as Groot says 'I am Groot' and Spider-Man says 'He is Groot', a dedication due to Duncan's passing in 2012 where the episode was dedicated in memory of him. Groot returns in "The Return of the Guardians of the Galaxy" alongside the other Guardians to repair their spaceship at the same time when Titus was leading the Chitauri army into targeting Nova's helmet. While on Earth, Groot blended in by posing as a tree in front of Aunt May's house. The episode "Return to the Spider-Verse" Pt. 2 featured an alternate version of Groot who resides in a pirate reality and is the sentient pirate ship of Web Beard with his head being the figurehead of the pirate ship. Groot appears in Avengers Assemble, voiced by Kevin Michael Richardson. Groot appears in Hulk and the Agents of S.M.A.S.H., with Kevin Michael Richardson reprising the role. Groot appears in Marvel Disk Wars: The Avengers episode "Guardians of the Galaxy". Kevin Michael Richardson reprises his role in the animated series Guardians of the Galaxy. The episode "Origins" revealed that Groot's planet was invaded by Ronan the Accuser and Groot was the last of his kind once Ronan's army was done with the Flora Colossus. In the episode "Can't Fight This Seedling", Star-Lord fell into the green thing within Groot while fighting the parasitic fungus and had a vision that the green thing can be used to recreate the Flora Colossus race. Baby Groot appears in "Mission: Breakout", the title of the third season. Groot appears in the Christmas TV special Marvel Super Hero Adventures: Frost Fight!, voiced again by Kevin Michael Richardson. In order to obtain money to repair their ship, Groot and Rocket Raccoon take up the bounty to apprehend Santa Claus where they have an encounter with Mrs. Claus. Groot appears in the Rocket and Groot shorts, voiced again by Kevin Michael Richardson. Groot appears in Lego Marvel Super Heroes - Guardians of the Galaxy: The Thanos Threat, voiced again by Kevin Michael Richardson. Groot in a character poster for the 2014 film Guardians of the Galaxy. Groot appears in the 2014 Marvel Cinematic Universe film Guardians of the Galaxy, voiced by Vin Diesel (who performed the voice work for a number of languages the movie was released in and also provided some motion capture elements for the character). Although initially simply described as Rocket's hired muscle, he shows a softer side throughout the film, growing a flower to give to a little girl and saving Drax the Destroyer's life even after Drax's actions brought Ronan the Accuser's forces to them. He agrees with Peter Quill's plan to stand up to Ronan, and later seemingly sacrifices himself to save the rest of the team by enveloping them in a wooden ball grown from himself as Ronan's ship crashes. At the film's conclusion, Rocket has recovered a twig from Groot, which is shown to be regrowing into a miniature Groot; this new Groot is actually Groot's offspring. When sacrificing himself, he actually speaks another phrase, "We are Groot", which implies a bond formed among the heroes. Vin Diesel again voices and motion-captures Groot in Guardians of the Galaxy Vol. 2, released in May 2017. Still a small child in the film, Baby Groot continues to travel with the Guardians, but genuinely acts like a child, such as dancing to music while the rest of the team are trying to defeat a monster. He is briefly captured by the Ravagers, along with Rocket and Yondu, while Quill, Drax and Gamora are visiting Quill's father Ego, but when the Ravagers mockingly decide to make him their mascot, Groot is able to help Rocket and Yondu escape capture and go to assist the other Guardians in the confrontation with Ego. In the final battle, Groot is entrusted with planting a bomb on Ego's core as the only person small enough to fit through the cracks, although he was initially unable to remember which button on the bomb would start the timer and which would set it off immediately. In a mid-credits sequence, Groot has grown to a rebellious adolescent stage. Diesel reprised his role again in the 2018 film Avengers: Infinity War, with Groot in his adolescent form from Guardians of the Galaxy Vol. 2. In the film, Groot accompanies Rocket and Thor to Nidavellir, where Thor asks the dwarf king Eitri to forge a weapon. He assists Eitri in molding the weapon, and severs one of his arms, which forms the handle of Thor's new weapon, Stormbreaker. He later joins the rest of the Avengers and Rocket in the battle of Wakanda. Groot is one of the victims of Thanos after he claims all of the Infinity Stones and wipes out half of all life in the universe. Groot is listed among the characters who will appear in Avengers: Endgame and Guardians of the Galaxy Vol. 3. Diesel voices Baby Groot in the 2018 Disney film, Ralph Breaks the Internet. On the Oh My Disney! site, he answers questions about the Marvel characters by quoting "I am Groot" until Vanellope Von Schweetz crashes the inquiry and gives the visitors a pop-up ad for Wreck-It Ralph's video. Groot appears as a summon skill for Rocket Raccoon called "My Friend Groot", in Marvel Heroes. He also appears in the game as a team-up hero. Groot appears as a playable character in Lego Marvel Super Heroes, voiced by Troy Baker. Groot was a playable character in the Marvel: Avengers Alliance game on Facebook. Groot is a playable character in Disney Infinity: Marvel Super Heroes, voiced by Kevin Michael Richardson. Groot is a playable character in Marvel Contest of Champions. Groot is a playable character in Marvel: Future Fight. Groot appears in Guardians of the Galaxy: The Telltale Series, voiced by Adam Harrington. Groot appears in Marvel vs. Capcom: Infinite as part of Rocket Raccoon's assist call-based moves during Rocket's gameplay. Kevin Michael Richardson reprises his role. Groot is as a playable character in Lego Marvel Super Heroes 2, voiced by Stefan Ashton Frank. He has three variations including Small Groot (based on Baby Groot from the second film), Small Groot with a Ravager uniform, and normal-sized Groot. A Groot action figure was included with the Guardians of the Galaxy pack in 2011 part of the Marvel Universe toyline. A Rocket Raccoon and Groot figure set with a "Dancing Baby Groot" will be released by Hot Toys. Funko announced the "Dancing Groot Funko POP" vinyl figure on August 26, 2014 and released it shortly after Christmas 2014. Groot has appeared 11 times in the miniature game HeroClix, often alongside Rocket Raccoon. In 2014, Twilio employee Ricky Robinett set up a phone number at which Groot can be texted, (866) 740-4531, which results in the character's familiar response "I am Groot". Baby Groot appears in the ride Guardians of the Galaxy Mission Breakout at Disney's California Adventure, voiced by Fred Tatasciore. He and the other Guardians are captured by the Collector and have to be rescued by Rocket and the guests. In the Halloween version of the ride titled "Monsters After Dark," the Guardians accidentally left Groot behind during their escape, so Rocket goes back and has the guests distract Surtur's Fire Dragon so they can escape. Groot was ranked #16 on a listing of Marvel Comics' monster characters in 2015. Rocket Raccoon & Groot: The Complete Collection (softcover, April 2013, ISBN 978-0-7851-6713-6) collects: a story from Tales to Astonish #13, the story from Marvel Preview #7, The Incredible Hulk #271, Rocket Raccoon Vol. 1 #1–4, Annihilators #1–4, and Annihilators: Earthfall #1–4. Rocket Raccoon & Groot Vol. 0: Bite and Bark (softcover, October 2016, ISBN 978-1302902186) collects: Rocket Raccoon Vol. 2 #1-11, Groot #1-6, and material from Guardians of the Galaxy: Tomorrow's Avengers #1. Rocket Raccoon & Groot Vol. 1: Tricks of the Trades! (softcover, August 2016, ISBN 978-0785199731) collects: Rocket Raccoon & Groot #1-6. Rocket Raccoon & Groot Vol. 2: (softcover, November 2016, ISBN 978-0785199748) collects: Rocket Raccoon & Groot #7-10, TBD. ^ Fenn, Mike (August 5, 2014). "Like 'Hodor,' 'I Am Groot' is already becoming a loved Internet meme". The Daily Dot. Archived from the original on August 19, 2015. ^ Christiansen, Jeff (March 10, 2011). "Groot". Appendix to the Handbook of the Marvel Universe. Archived from the original on November 13, 2013. ^ Richards, Dave (October 14, 2012). "NYCC: Bendis, McNiven & Wacker Relaunch the Guardians of the Galaxy". Comic Book Resources. Archived from the original on December 6, 2013. Retrieved October 15, 2012. ^ Phegley, Kiel (March 7, 2015). "Comics Newcomers Declare 'I Am Groot' With New Marvel Spinoff Series". Comic Book Resources. Archived from the original on September 5, 2015. ^ "I Am Groot: Hardwood History". News - Marvel.com. Retrieved 24 November 2017. ^ Puello, Ronel. "Guardians of the Galaxy's Groot is Puerto Rican". The Flama. Archived from the original on October 7, 2016. Retrieved February 18, 2016. ^ Rogers, Vaneta (May 14, 2008). "Greeting the Guardians: Rocket Raccoon, Groot". Newsarama. Archived from the original on February 21, 2009. ^ Guardians of the Galaxy Vol. 4 #10-12. Marvel Comics. ^ Monster Unleashed Vol. 2 #1. Marvel Comics. ^ Secret Empire #3. Marvel Comics. ^ All-New Guardians of the Galaxy #9. Marvel Comics. ^ "Groot On Screen Powers, Villains, History | Marvel". Marvel Entertainment. Retrieved 2019-02-21. ^ Arbeiter, Michael (August 1, 2014). "Other Films and TV Shows Where You Can Find the Guardians of the Galaxy". Hollywood.com. Archived from the original on August 4, 2014. ^ Beard, Jim (September 6, 2012). "Marvel Remembers Michael Clarke Duncan". Marvel Comics. Archived from the original on 2012-09-09. Retrieved September 9, 2012. ^ "Marvel's Avengers Assemble Clip: Teaming with the Guardians of the Galaxy". IGN. April 4, 2014. Archived from the original on April 13, 2014. Retrieved May 7, 2014. ^ Melching, Steven (writer); Archibald, Patrick (director) (July 6, 2014). "It's a Wonderful Smash". Hulk and the Agents of S.M.A.S.H. Season 1. Episode 26. Disney XD. ^ Disney Channel PR [@DisneyChannelPR] (17 February 2015). "Kevin Michael Richardson @ClevelandJr will voice #Groot on #DisneyXD's #GuardiansOfTheGalaxy #GuardiansVoiceCast:" (Tweet) – via Twitter. ^ Kit, Borys (July 14, 2012). "Comic-Con 2012: Marvel Names Avengers Follow-Ups; Robert Downey Jr. Makes Surprise Appearance". The Hollywood Reporter. Archived from the original on August 5, 2012. Retrieved July 16, 2012. ^ Turek, Ryan (August 27, 2013). "Vin Diesel Confirms Plans to Do Groot's Motion Capture Work". ComingSoon.net. Archived from the original on November 2, 2013. Retrieved May 7, 2014. ^ "Official: Vin Diesel to Voice Groot in Marvel's Guardians of the Galaxy". Marvel Comics. December 21, 2013. Archived from the original on October 16, 2016. Retrieved December 21, 2013. ^ "Groot is dead". Twitter. ^ "Marvel Studios Begins Production on Marvel's Guardians of the Galaxy Vol. 2". Marvel.com. February 17, 2016. Archived from the original on 2016-02-17. Retrieved February 17, 2016. ^ "Vin Diesel: Groot & Hulk Must 'Get Down' in Infinity War". Screenrant.com. 20 January 2017. Archived from the original on 2017-01-21. Retrieved 24 November 2017. ^ "James Gunn explains Groot's age difference in 'Guardians 2' vs. 'Infinity War' footage". Ew.com. Archived from the original on 2017-07-24. Retrieved 24 November 2017. ^ Lincoln, Ross A. (July 29, 2016). "Marvel's Avengers 3 Gets Official Title With Temp Name Hung On Avengers 4". Deadline Hollywood. Archived from the original on July 31, 2016. Retrieved July 30, 2016. ^ "Ralph Breaks the Internet - Press Kit" (PDF). wdsmediafile.com. Walt Disney Studios. Archived (PDF) from the original on 2018-11-05. Retrieved November 18, 2018. ^ Marvel Entertainment [@Marvel] (17 October 2013). "#Groot joins #LEGO #Marvel Super Heroes, and we've got your EXCLUSIVE first look!" (Tweet) – via Twitter. ^ "Groot". Behind the Voice Actors. Archived from the original on August 24, 2014. ^ "Lego Marvel Super Heroes 2 coming to PC, PS4, Switch, Xbox One". Polygon.com. 15 May 2017. Archived from the original on 2017-05-16. Retrieved 16 May 2017. ^ Ratcliffe, Amy (August 6, 2014). "Rejoice Because Hot Toys Is Making THAT Groot Toy from Guardians of the Galaxy". Nerdist. Archived from the original on August 8, 2014. The potted Groot is a bonus accessory available exclusively to people who order the Hot Toys Rocket Raccoon and Groot figure set from Sideshow Collectibles. ^ Kumparak, Greg (September 15, 2014). "You Can Now Text Groot". TechCrunch. Archived from the original on October 23, 2014. ^ Glover, Erin (October 23, 2017). "Experience Guardians of the Galaxy – Monsters After Dark All Day on October 31 at Disney California Adventure Park". Disney Parks Blog. Retrieved October 29, 2017. ^ Buxton, Marc (October 30, 2015). "Marvel's 31 Best Monsters". Den of Geek. Archived from the original on 2018-09-30. Retrieved 2018-09-30. Groot was once an almost forgotten Kirby Kreature of the pre-Marvel Age until fans became hooked on a feeling and fell in love with this space Ent.